Palm exist on the fringes of indie rock. In the era of introverted solo acts and “sad-person” bedroom tunes, the band has continued to carve their own sound from untapped pockets of outsider and experimental music. Their story is an unlikely one, but somehow makes sense in the context of their sound. 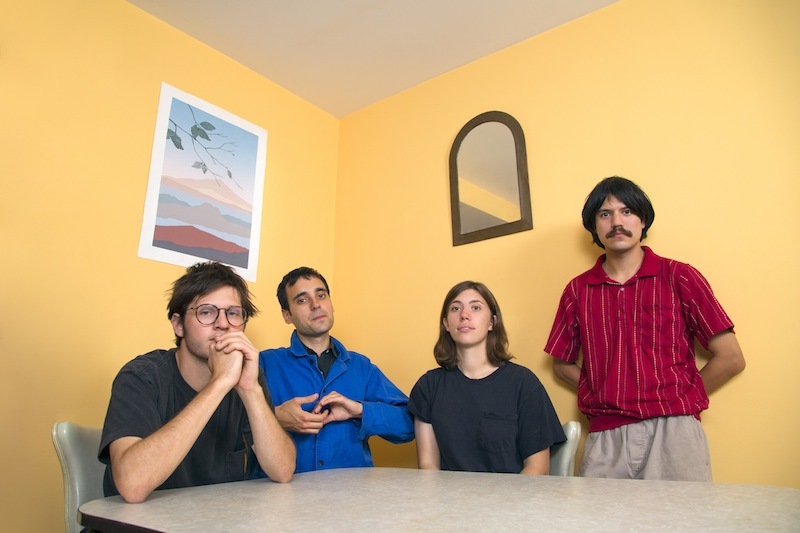 Palm’s hypercritical creative process and unorthodox trajectory as musicians is something to marvel—they’re all self-taught and fairly new to their instruments. Since 2012, they’ve honed, imploded and backpedaled their own sonic format, performing early unofficial tracks for kicks and scrapping an excellent EP along the way. Rock Island is Palm’s Carpark debut, introducing the unparalleled Philly foursome to the independent mainstream. Palm’s stellar sophomore release furthers the band’s notably outlier style, pulling influence from discordant punk contemporaries such as New Fries and Hellier Ulysses, cult classics like This Heat and Captain Beefheart and unlikely left-field artists DJ Rashad and Foodman. Rock Island is the most polished and focused experimental indie rock record you will hear in 2018; a pivotal moment for introducing a wider audience to the group’s unconventional instinct for naturally subliminal rhythms and colorfully fractured melodies. I was lucky enough to chat with founding member and guitarist Eve Alpert about wearing other bands’ shirts, collaborating with friends and Palm’s unusually synesthetic tunes. What’s the first piece of physical music you ever bought with your own money? 3LW CD from the Virgin Megastore in Times Square. That was probably my own money. Probably 2000, 2001? Whenever that record came out. From allowance money or something. What was the name of the record again? 3LW. They were kind of a one-hit wonder pop group. I showed my mom my favorite song and she definitely didn’t think it was appropriate for me after I got it. But for some reason, it was really good. Cool, buying it for the single? Do you wear any band/artist merch? For sure. I wear a shirt by a band called Bodymeat. Yeah, they live next door to us. I really like the design. I have a lot, but I don’t wear a ton just because they’re usually white and they get dirty. But I love the Bodymeat shirt. Last I heard you were living in Philly with Banned Books. Are you still there while not touring? I’m not in that same house anymore, but I live with a former member of Banned Books. I live with some other musicians as well. Your music, to me, seems to be super visual, which is a sensory experience that has never really resonated with my relationship to music besides specific memories associated with specific pieces of music. Would you consider Palm a visual band? Definitely. I don’t think we really are thinking about that when we’re writing music, but I always hope people can feel that way when they’re listening or seeing us at a show—maybe space out and see things. It’s not really conscious, but it’s definitely really cool some people say that. Funny you should bring up Bodymeat. My friend who helped work on the video for “Dog Milk,” Daniel Brennan, told me about Bodymeat. That’s really funny, Dan is so sweet. Actually Dan just came to the city and helped film our release show at Market Hotel. It was cool. It was kind of all Richard Smith and Daniel’s brain project. We were only really there during an off day of touring in Philly. They shot the scenes with us in them over the course of a few hours on the rooftop of our house and then in a different space. Everything else was sort of them—Richard exploring the city and Dan doing a lot of filming and coloring. It was awesome. It was really cool to work with people we’re close with. We get uncomfortable with stuff like that—press photos, video, stuff like that, so it was nice to work with people we really admire do something we knew would be great no matter what. Also it was cool they were from Philly. Do you work with a lot of other collaborators and artists from Philly? We try to. We get our shirts made in Allentown, Pennsylvania, which is really nice to be able to work with somebody who works in the state with a lot of other local bands and puts out really good work. I’d love to work with more local artists. It’s really fun collaborating with other artists on poster designs or t-shirts. For the most part it’s been with artists we’ve found all over the country. What’s your favorite Palm song to play? The first couple of songs you wrote in your dorm room with Kasra in your dorm room at Bard—would those songs find their way to Palm’s Into the Bulk EP? Our first songs written in our dorm room were not on Into the Bulk. They were recorded on a little cassette player, which I still have. Was it stuff you didn’t play live? No we played live. I think we wanted to keep writing songs. The first songs we wrote we started in high school, between Kasra and I, and I think we wanted to write more songs as a collective before we tracked or recorded anything. Those first songs were mushy and made for guitar, not for the group. What made Palm pull Into the Bulk from Bandcamp? I don’t think we felt connected to the music anymore. I think it’s cool to hear. I don’t hear it very much, but people like those songs. I don’t feel it was any representation of us now. I don’t think we would have done that if we cared even a hair about music or recording. It felt so, not even Palm. Did (your sound-collage project) JMC’s Ostrich Vacation modify the group’s approach to songwriting in any way? Totally. We were basically asked to release new music with JMC, a bunch of bands were. We didn’t have anything ready or anything we wanted to put on that, so we gave ourselves three days in our rehearsal space to write and record and it was a really good, eye opening experience for us to try to do something off the cuff and experiment with whatever tools we had in the room. It’s not a revolutionary idea but we usually take a lot of time to write songs and this opened our eyes to new sounds and little approaches. They were experiments for us. We were just talking about it the other week about doing it again—not for release but to write new songs. Go somewhere, take a few days with nothing preplanned and record. It’s a fun getaway to try different things. You’ve mentioned in interviews the band’s experimentation and deconstruction of meter—random patterns on drum machines and noises that break the ambience of settings. Have any of those methods ever materialized into a Palm song? Totally. The guitar loop that Kasra plays in the song “Dog Milk” was initially a drum machine pattern that weird drum loop that he made on a Korg machine. Hugo treated that drum machine like a ruler and wrote his beat using that as a background. It was a new way for Hugo to write his part and help arrange the song, using the drum machine as a ruler. Was the drum machine tuned or did he come up with the notes for it after? Maybe he would correct me but I believe he came up with a random pattern for fun. No tuning. Then he started playing over it and it stuck with him. Then he showed it to Hugo and he began experimenting over that and they wrote the core rhythm in the song. A lot of people think it’s random, what he’s playing, but I don’t. You mention the musical impact of a Peruvian foreign exchange student who lived with you for a year and half when you were 16. Do you think he had a removed perspective and influence on the way you would approach music in the future? Honestly, he just opened my eyes to playing music in general. He was into a lot of punk and I never thought about taking any instrument seriously before meeting him. I don’t have siblings so it felt like your older sibling inspiring you to act a certain way or try certain things. It was like having a big brother who was into music and was playing guitar. That seemed like a really cool thing to do and it made me want to continue.